CM Comment: A very worthwhile video. More and more, engagement is being viewed as the core metric when valuing online marketing. This video will give you a better understanding of the value of online campaign engagement, plus why you should plan on using engagement tools in all of your upcoming interactive media activities. CM Comment: An interesting attempt by a casino to push far into the realm of social media. Can't wait to see how this one plays out. April 6, 2009: summarized from Marketwire -- Barona Resort & Casino is launching a new social networking campaign encouraging people from across the country to create a video that captures the magic of gambling. Called the Barona Video Contest, Hollywood hopefuls are invited to share stories about what they love about casinos -- the sights, the sounds, the games and the thrill of winning. The creator of the highest rated video will win a total cash prize of $5,000 while the finalists and even online voters will share a total of $17,000 in additional cash prizes. "Barona's Video Contest is intended to open new doors of awareness for our property through a combination of online, social, viral, traditional and in-house media," said Troy Simpson, senior vice president of innovation at Barona Resort & Casino. "While we have been integrating social media into our marketing for quite a while, this is our first major foray into the space. We are excited to tap new audiences and gain insight into the mind of our customers." The premise of the contest is easy: demonstrate, in up to two minutes, what you love most about casinos. Is it poker, blackjack, slot games, casino movies, gambling as a sport? Is it the thrill of winning? A casino promotion? The atmosphere? The food? The entertainment? Do you have a winning moment at Barona to share? Or, what do you love most about Barona Resort & Casino? "In recent focus groups and research, we've discovered that our guests just love to share their experiences and opinions about Barona," continued Simpson. "We thought this would be a great way for them to visually express what they love best and share their favorite gaming moments with the world. We expect that we'll get some very creative entries!" CM Comment: Yet another example of casual games (very often casino-themed) being the "hit" content that draws them in. April 5, 2009: summarized from Financial Times -- Spectacular growth in online social gaming is prompting companies such as Google to enter the market and developers to rethink how they design video games. The trend is seeing the social network Facebook emerge as the world's biggest gaming platform. It is closing on 200 million active members and its most popular application installed by users is a game - Texas Hold 'em poker - played by 11 million people. Social gaming was a hot topic at the recent Game Developers Conference in San Francisco. "The biggest shift is that, in the past, most of the social gaming has been with people that you don't know, with Facebook that's completely changed," said Brian Fargo, a game developer. He described a bowling game on Facebook where he can see all of his friends and their high scores. "I want to play now because I want to beat them. The social dynamic of knowing the people out there really changes things for me," he said. "So you're saying that we've found a way to monetize peer pressure," responded Will Wright, creator of The Sims and Spore. Online gaming on services such as Microsoft's Xbox Live, which has 17 million members worldwide, or PC casual gaming destinations such as Pogo or Big Fish, generally takes place between strangers. "Social gaming is the new casual," says Michael Cai, video game analyst at the Interpret research firm, referring to the previous hot trend. "If the casual gaming portals don't pay attention and take action as their audience migrates to some of these social gaming platforms then they are going to lose their business for sure." CM Comment: Report indicates that 45-54 year olds are 36 percent more likely than average to visit Twitter. Definitely a surprise. April 7, 2009: summarized from comScore --Twitter seems to be just about everywhere these days, infiltrating pop culture and challenging traditional communication channels as people answer the simple Twitter question, "What are you doing?" Many people have hopped on the Twitter bandwagon - from businesses to celebrities to professional sports players to President Obama. Over the past several months the traffic to Twitter has exploded. Worldwide visitors to Twitter approached 10 million in February, up an impressive 700+% vs. year ago. The past two months alone have seen worldwide visitors climb more than 5 million visitors. U.S. traffic growth has been just as dramatic, with Twitter reaching 4 million visitors in February, up more than 1,000% from a year ago. Reuters' reporter Alexei Oreskovic recently authored an interesting blog post about the demographics of Twitter users. What he discovered was that 18-24 year olds, the traditional social media early adopters, are actually 12 percent less likely than average to visit Twitter (Index of 88). It is the 25-54 year old crowd that is actually driving this trend. 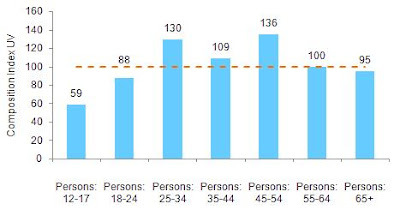 More specifically, 45-54 year olds are 36 percent more likely than average to visit Twitter, making them the highest indexing age group, followed by 25-34 year olds, who are 30 percent more likely. The skew towards older visitors, although perhaps initially surprising for a social media site, actually makes more sense than you might think at first. With so many businesses using Twitter, along with the first generations of Internet users "growing up" and comfortable with technology, this is a sign that the traditional early adopter model might need to be revisited. Not only teenagers and college students can be counted among the "technologically inclined," which means that trends are much more prone to take off in older age segments than they used to. And with those age 25 and older representing a much bigger segment of the population than the under 25 crowd, it might help explain why Twitter has expanded its reach so broadly so quickly over the past few months. CM Comment: Some good ideas in this one. March 31, 2009: summarized from ClickZ -- What's clear: everything we do online is getting integrated and intermeshed into a unified platform that can drive traffic, generate leads and sales, and encourage high-value brand interactions. Here are a few tips and tricks that have the potential to add a high level of social octane to any online campaign. If you don't have a social media platform for your company, create one! Start with the basics: Facebook, MySpace, YouTube, Twitter, and a blog. If you are a B2B (define) company you may want to add SlideShare to that list. Wrangle up content that you already have and create a publishing schedule for the platform. Pepper the content mix with things that add relevance and fun. You know, things that you would not spend media dollars promoting but are important like industry news and facts, best practices, humor -- things that your target audience would find interesting. Now that you have a platform, don't always feel like your media, paid search, and SEO campaigns must drive traffic to your site. Think of your Facebook page as a microsite, your YouTube Channel as a video microsite, and your Twitter account as your micro-blog. Encourage viral social sharing by having chiclet-enabled calls to action in your banners, landing pages, and site. That includes things like "tweet this coupon" or "post this video to your Facebook page." Promote your social media assets (channels, platforms, blogs, etc.) like crazy. Post them on your site, drop press releases about them in the wire services, and link to them from your site and in e-mail signatures. Track things like profile and channel visits, friends, fans, followers, and of course blog chatter. You can track how much traffic and actions in general you get from the major social sites using a Web analytics application like Google Analytics. From these metrics, you can apply a real media value using average CPMs (define) and CPAs (define). For example if you generate 100,000 video views on your YouTube channel of a product demo, what would you have paid to do that buying 30 second pre-roll spots?